Having raced back, we made a trip across the water to perform Path of Miracles in the City of Derry International Choir Fesitval, and then for the last performance this year, in the staggeringly beautiful Canterbury Cathedral. To finish off our tour with this wonderful work, all about Pilgrimage, in the greatest pilgrimage centre in the UK was very special indeed. A moving and fitting end to what has been a fantastic sequence of concerts organised by Henry Southern, our wonderful and extraordinary manager! We then launched straight into a programme of Bach motets together with other pieces by Schütz and Reger. All wonderful stuff and superbly sung by our senior team of Katie Trethewey, Emilia Morton, Emma Walshe, Jessica Cale, Martha Mclorinan, Ellie Minney, Jeremy Budd, Nick Todd, Steve Kennedy and Jimmy Holliday. Even by our own usual high standards this was a truly exceptional performance by the singers. If you can ever get to hear these guys singing Bach then it’s definitely worth every effort! We were joined by the Steinitz Bach Players for a joyful rendition of Bach’s Lutheran Mass in F major. What fun that piece is. I really look forward to repeating it sometime soon. We had two great days at St John’s Leatherhead again, working with their various choirs and we were joined by their exceptionally talented small choir ‘’Schola Cantorum’ for Owain Park’s Footsteps. We performed our Remembrance programme which includes the awesome piece Friede auf erden by Schoenberg. This will be the focus of our concerts over the next 12 months or so and it’s an extremely intense and emotional sequence, all highlighted by the stunning singing of Martha Mclorinan in Judith Bingham’s new piece, A Walk with Ivor Gurney. We then raced up to give another performance of this programme in the beautiful hall at Snape Maltings. What a wonderful atmosphere in that space and one of the quietest and most attentive audiences ever! All of these concerts have been great and I always feel privileged to work with our fabulous singers but even better was to come in November when we teamed up with Academy of Ancient Music, led by Bojan Cicic, for a performance of Bach’s great B Minor Mass. 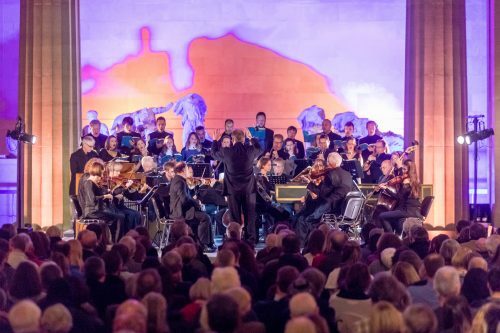 We performed in the Parthenon room at the British Museum which gave us a very special atmosphere and I have to say it was one of the most enjoyable and artistically rewarding concerts I’ve ever had the pleasure to direct. The orchestra were a joy to work with and they inspired our singers to ever greater things. Again, I cannot wait to repeat this – there are two performances lined up or next year in Chipping Campden and the Cathedral at Bury St Edmunds. I’d say don’t miss them but of course I’m biased! Nigel conducting Tenebrae and the Academy of Ancient Music at the British Museum. Photo: Benedict Johnson. Copyright: Trustees of the British Museum.